Leading Manufacturer of dhoop batti & cones packaging box from New Delhi. 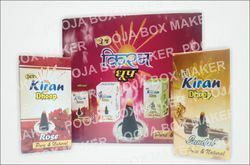 With phenomenal market understanding, we are able to introduce an extensive range of Dhoop Batti Packaging Box. This box finds large application use in packaging dhoopbatti. Long working life and accurate size is the most impressive feature of the box. In order to provide excellent production from the box, after manufacturing the box our professionals opts for strict quality checks. The offered quality checks include accuracy, size, wrapping, and better design. Packaging Details: we use heavy white coated duplex of 300gsm. with Lamination for Dhoop Batti packing.